This Safety Alert (SA) provides guidance about a boiler safety concern relating to specific Baxi and Potterton heat only gas boilers. It has been identified that under certain fault conditions products of combustion can be released from the condensate trap connection. On specific heat only boilers manufactured with a condensate trap positioned on the outside of the boiler, an unusual combination of factors occurring simultaneously (fault on fault condition) could give rise to a safety concern. The probability of this situation occurring is very low and a recent risk analysis undertaken by Baxi, has highlighted that under these rare circumstances, there is a potential risk of products of combustion being released into the adjacent living space as the seal between the condensate trap and boiler is not contained by the outer case. This notice only relates to the heat only boilers listed in the Boiler Identification Table (see below) manufactured between week 17 of 2014 and week 24 of 2017. These can be identified by the modification level of the serial number. 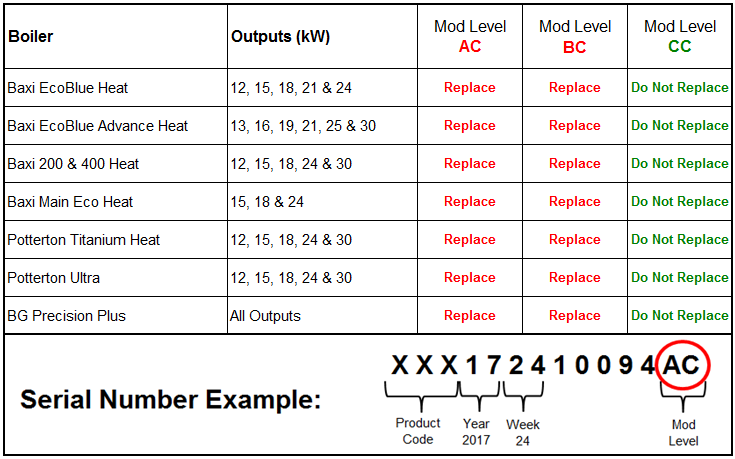 An example of the serial number format is shown below. Modification levels AC & BC require action, CC do not. Baxi will arrange to supply a replacement condensate trap retaining clip assembly completely free of charge to all boilers with an AC or BC modification level, as identified in Boiler Identification Table. When undertaking work on these boilers, Gas Safe registered engineers are advised to pay particular attention to the following details as this issue may not be immediately apparent. When attending a heat only boiler listed in the Boiler Identification Table, first check to see if the modification level of the serial number is in the identified range. The serial number is located on the boiler data plate and/or serial number/information label. If the boiler is found to have a modification level of AC or BC, check the condensate trap retaining clip. The condensate trap and retaining clip are located on the base of the boiler behind the User Interaction Controller/control panel (Figure 3). Removal of the User Interaction Controller/control panel facilitates inspection of the condensate trap retaining clip. If it is the original type (Figure 1) follow the ‘Actions’ listed below. Baxi recommends that all condensate retaining clips of the original type are exchanged irrespective of their current condition. If it is the new type (Figure 2) no further action is required under this Safety Alert. However, all boiler checks in accordance with the Gas Safety (Installation and Use) Regulations (GSIUR) 26(9) must be completed and any subsequent actions applied as appropriate. 1. If the boiler has modification level AC or BC and the condensate trap retaining clip is the original type (Figure 1) a new condensate trap retaining clip assembly should be fitted. If a replacement clip assembly is not available during the inspection, the original trap and retaining clip should be checked to ensure it is fitted in accordance with manufacturer’s instructions and, a free of charge replacement retaining clip assembly should be obtained as detailed in SA 024 and fitted as a replacement at your earliest convenience. 3. If combustion performance is not in accordance with the manufacturer’s instructions, take the appropriate actions as defined in the Gas Industry Unsafe Situation Procedure (GSIUP). For technical assistance, please call the free Baxi dedicated helpline on 0800 169 5376.